Quick rallies make me a little more skeptical than usual. The bond markets seem to tickle the skeptic in me. In times of doubt, I turn to history for a new perspective through which to view the present moment. As I browsed through the past, I chanced upon this article on the Great Bond Massacre of 1994. As with almost all instances, the 1994 bond market episode is instructive as much for the parallels with the present moment as for the uniqueness. Back then, as today, bond yields were at historic lows and inflation was muted. Wages were subdued and companies were struggling to raise prices. At the same time, idiosyncrasies exist, making the comparison an interesting and instructive exercise. Cut to the present. Bond issuances have picked up strongly. July was the strongest month on record for global high-yield issuances ($24 bn). Companies sold $90 bn of U.S. corporate bonds in July, the most since 1999. Average yields on the securities fell to 5.01% on July 31, the lowest since April 2004. Bonds have outperformed equities YTD and Purchasing Manager's Indices have beaten expectations in several regions (barring China). The consensus seems to discount a low interest rate environment in the near-term and deflation seems to be at the top of the agenda. A sustained uptick on the indices could see GDP growth expectations headed in a direction that would make the deflation argument less forceful as time passes by. Could a surprise rate hike see a repeat of 1994? 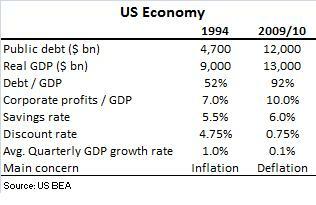 Here's a quick capture of economic data from 1994 compared to the present. Budget deficit was $200 bn back then. It is $1,500 bn today. Debt-to-GDP ratios have jumped sharply over the years and average GDP growth rates were vastly different between then and now. Increasing indebtedness and an unprecedented economic slowdown have led to interest rates hovering at near-zero today. US consumers are emerging from a period of historically low savings rates. As they grapple with a sluggish economy and a period of personal balance sheet retrenchment, the government's stimulus/quantitative easing (QE) programs are likely to have only a limited effect in jump-starting consumer spending. The Fed wants consumers to spend at precisely the moment when they seem most ill-equipped to do so! Low rates notwithstanding, I think consumer spending will take longer to recover than in previous instances (1973/75 recession a good example). The QE could see inflation rearing its head in the future but the probability of this scenario playing out in 2011 seems remote. This would imply two things; (1) interest rates will continue to be low for a longer period than in previous instances and, (2) there is a risk of the US getting stuck in a Japan-like deflation spiral. I believe the consensus is focusing on these two broad factors, explaining the rally in bonds YTD relative to equities. However, a couple of things force me to consider the alternative hypothesis. (1) The encouraging corporate profits as a % of GDP number compared to 1994. Since bottoming in 4Q2008 (~8%) , this metric has been on an uptrend. (2) The room for maneuver of interest rates. Rates are at near-zero bound and the low rate/deflation hypotheses largely seem discounted in prices. When the weigh balance of investor preferences tilts to one side, it is always useful to consider the other side of the weighing scale. Consensus seems to be firmly behind bonds currently. From the above exposition, and YTD outperformance of bonds over equities, I think risk-reward favours equities relative to bonds in the near-term. Bonds may not pop as in 1994, but the risks of a GDP spike increases the risk of a rate hike, which would impact bonds more negatively compared to equities.